One of my personal musical weaknesses is for good rockabilly, a genre there's not enough of, really, limited to a cult genre as far back as I can remember (the late '80s, unfortunately), which lives through the present only in the occasional band that sprouts up here or there. The Flat Duo Jets weren't just a rockabilly duo, but a pair more along the lines of onetime tour mates the Cramps, minus that blatant spook and raunch, a bit less gimmickry. They fit the same psychobilly camp, though, that moment of harmony where '50s rock and roll gets hit with a punk snarl. 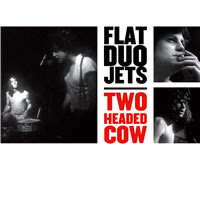 Several years after a breakup, and the releases of solo efforts by both vocalist/guitarist Dexter Romweber and drummer Crow Smith, the Flat Duo Jets would be documented in the film Two Headed Cow, for which there is now this fine soundtrack which collects a group of Jets songs from 1986. Considering the wildness of the band's style, it's a bit interesting to note Romweber's appreciation of the purity in '50s music, like that of the Coasters and Elvis Presley, which he mentions in Two Headed Cow. In explaining himself further, it becomes clear that this purity he sought was in the form of music free of electronic influence or contrived, glossy style and production. Free of the traits that made him dislike modern music, which, in the mainstream, mostly continues to lack a raw element even today. To hear him play as one half of the Flat Duo Jets, then, is a breath of relief, free of hypocrisy. There's a lot of fire in Romweber's guitar, a wealth of noise and distortion that's fearlessly spat out with the melody of rockabilly and the urgency of punk rock. His voice is like that of Buddy Holly's, if Holly had lived long enough to be set free from 1950s restriction and let loose a strong, hideous growl. And Smith, his drumming partner, gets so well intertwined with Romweber's guitar that you hardly notice him, yet the way he blends in allows him to drive further forward that furious guitar and place a stronger emphasis on the guitar's heaviest rhythms. Real shame that this band no longer exists, and an even bigger shame that much of the writing done on this band mentions the White Stripes, who – unlike the Flat Duo Jets – started to lose much of that fury fairly early on. Purchase the Two Headed Cow soundtrack.